Atlantic Division Champions for the 2017-18 season, the Lehigh Valley Phantoms (47-19-5-5, 104 pts., 0.684 pts., pct.) continue their quest for the 2018 Calder Cup Championship this weekend as they kick off their best-of-seven, Atlantic Division Finals series against the Charlotte Checkers. As the top seed in the Atlantic Division portion of the 2018 Calder Cup Playoffs, the Phantoms will host Game 1 this Friday, May 4 at PPL Center followed by Game 2 on Saturday, May 5 in downtown Allentown. Tickets for both highly-anticipated postseason showdowns at PPL Center are available now by clicking HERE. Charlotte will then host Game 3 on Tuesday, May 8, Game 4 on Wednesday, May 9 and Game 5 (if needed) on Saturday, May 12 at Bojangles’ Coliseum. If necessary, the best-of-seven series will then shift back to PPL Center for Game 6 on Monday, May 14 and decisive Game 7 on Tuesday, May 15. The Phantoms advanced to the second round of the Calder Cup Playoffs for the first time since arriving in Lehigh Valley thanks to a first-round victory over the Providence Bruins. 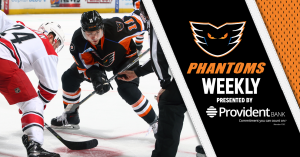 After splitting the first two games at Dunkin Donuts Center in Providence in mid-April, the Phantoms won both tilts in downtown Allentown this past weekend in claiming the best-of-five series three games to one. Lehigh Valley will now grapple with the Checkers, AHL affiliate of the Carolina Hurricanes, for the right to advance to the Eastern Conference Finals. Third-seeded Charlotte advanced to the second round of the 2018 Calder Cup Playoffs thanks to an opening round, three-game sweep of the second-seeded Wilkes-Barre/Scranton Penguins. The Phantoms posted a 4-4 mark during the 2017-18 regular season against Charlotte, which included a 3-1 record in games played at PPL Center. Overall, the Checkers outscored Lehigh Valley 28-22 in eight regular season meetings but was outscored by the Phantoms 12-11 in four head-to-head showdowns in downtown Allentown. Lehigh Valley’s Greg Carey (3 goals, 3 assists), Nic Aube-Kubel (2 goals, 4 assists) and Phil Varone (goal, 5 assists) paced all Phantoms in the season series with six points each while Charlotte’s Nicolas Roy (3 goals, 4 assists) and Andrew Miller (2 goals, 5 assists) led the Checkers offensively during the regular season set. 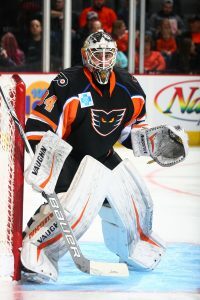 Goaltender Alex Lyon, who recorded 49 saves in Lehigh Valley’s series-clinching overtime victory against Providence in Game 4, posted a 2-1 record in three games against the Checkers during the regular season to go along with a 2.35 goals-against average and 0.926 save percentage. Meanwhile, Charlotte’s Alex Nedeljkovic was 1-3 in four meetings with Lehigh Valley while posting a 3.78 goals-against average coupled with a 0.881 save percentage. Thanks to a pair of home wins last weekend, the Phantoms enter the week having won nine straight games at PPL Center. What’s more, Lehigh Valley has posted a sensational 19-1-2 mark in downtown Allentown since January 13. Meanwhile, after its three-game sweep of the Penguins, Charlotte enters the series having won 10 straight games and has gone 13 straight outings without a regulation loss (12-0-1). 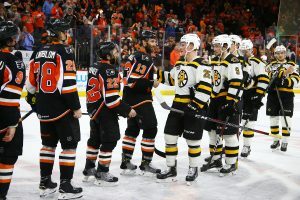 The Atlantic Division Finals will pit the two highest-scoring offenses in the American Hockey League against one another. The Checkers paced all 30 AHL clubs during the regular season averaging 3.45 goals per game while the Phantoms were second at 3.42 goals per outing. Goaltender Alex Lyon (right) was brilliant in Lehigh Valley’s first round series win over Providence. The second-year netminder produced a 2-1 mark in three starts to go along with a 2.76 goals-against average and 0.930 save percentage. He notched at least 31 saves in all three appearances, including a career-high 49 denials in series-clinching Game 4. Fresh off a 27-game stint with the Philadelphia Flyers, Oskar Lindblom made an immediate impact in his return to Lehigh Valley as he netted a pair of goals as the Phantoms outlasted the Providence Bruins 4-1 in front of 6,956 fans inside PPL Center in Game 3 of the Atlantic Division Semifinals. The victory gave the Phantoms a two games to one lead in their best-of-five series with Providence. Mike Vecchione added a goal and an assist and Phil Myers tallied his first professional playoff goal to round out the scoring in front of goaltender Dustin Tokarski who backstopped the triumph with an impressive 32-save performance. The victory was the Phantoms first home playoff win since arriving in Lehigh Valley and the franchise’s first home postseason triumph since the Philadelphia Phantoms earned a 2-0 win over the Albany River Rats back on April 29, 2008. Maxim Lamarche netted the game winner with just 1:24 left in overtime as the Phantoms topped the Providence Bruins 4-3 in front of 6,739 fans inside PPL Center in series-clinching Game 4 of the Atlantic Division Semifinals. With the win, Lehigh Valley ousted Providence in four games in their best-of-five series. Alex Lyon turned in a herculean effort between the pipes in securing the victory as he turned aside 49 of Providence’s 52 total shots in the game, including a remarkable 14 saves during overtime. Chris Conner notched two goals and an assist while T.J. Brennan opened the scoring for the Phantoms in the triumph. This marks the team’s first playoff series victory since arriving in Lehigh Valley and the franchise’s first trip to the second round of the Calder Cup Playoffs since 2008. Service Electric’s TV2 Sports will be broadcasting live each of the Phantoms’ home games throughout the 2018 Calder Cup Playoffs. If you can’t make it out to the rink, be sure to catch all the exciting action live in HD quality with Steve Degler, Todd Fedoruk, Doug Heater and Kristi Fulkerson! Pre-game coverage begins with “Phantoms Front and Center” 30 minutes before puck drop. 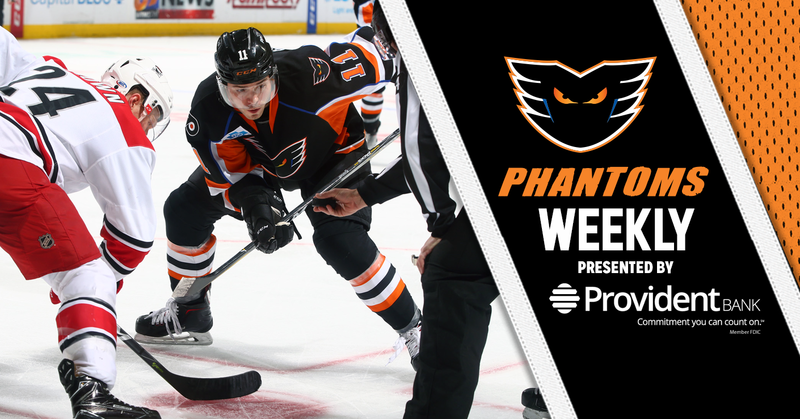 Be sure to also catch each and every Phantoms game this season live on 1470-AM WSAN, 790-AM WAEB or via the iHeartRadio app and Phantoms365 app! Join Voice of the Phantoms, Bob Rotruck, for all of the heart-pumping action of Lehigh Valley Phantoms hockey whether the team is at home or on the road. “Countdown to Faceoff” begins 45 minutes prior to puck drop. Tickets for each and every Phantoms home game throughout the 2018 Calder Cup Playoffs are available online at pplcenter.com, by calling 610-347-TIXX  or in-person at the QNB Box Office [7th & Hamilton].